First produced at the Paris Opera in 1841, with Carlotta Grisi in the title role, Giselle epitomises the Romantic Ballet period. Originally set in rural Germany it is dramatically based on the legend of the Wilis, spirits of dance-loving brides who have died tragically before their wedding day. Led by the bitter Queen Myrtha they perform their ghostly rites and evilly seek revenge on any man who crosses their path. 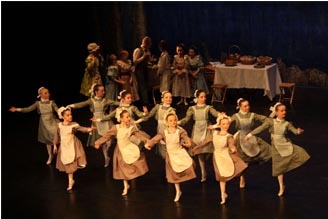 The production has been adapted for EYB's large cast by adding extra music from other ballets composed by Adolphe Adam and setting it on an English country estate in 1912. Prince Albert is an army officer peparing for the First World War. Although engaged to Lady Bathilde Albert is in love with Giselle and disguises himself as a Footman, a servant, in order to gain entry into the household in which Giselle is a governess to the aristocratic children. Giselle who has a weak heart loves to dance but her Father, the Head Butler, constantly warns her of her possible fate by relating the legend of the Wilis to the Servants and Villagers. 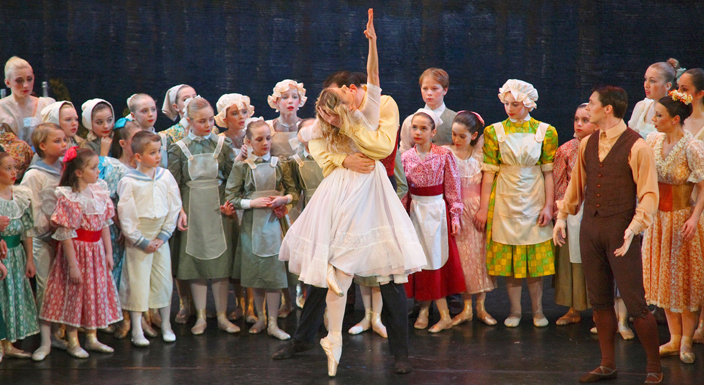 Seeing Albert and Giselle together during a celebration dance Hilarion at last reveals Albert as an imposter. He confronts him with his ceremonial sword to prove his true indentity, sounds the hunting horn and recalls the Hunting Party. Giselle is horrified and disbelieving to see Albert greet Lady Bathilde, his fiancée, with a kiss. She becomes deranged by the shock of being betrayed and as a result of her weak heart she dies at Prince Albert's feet. The Servants and Hunt visit Giselle's grave to pay their respects. Giselle is initiated into the Wilis and heartbroken Albert prays to see his beloved Giselle. She comes to him and although Myrtha, the Queen , condemns him to death Giselle saves his life by sustaining him through the night and dancing with him until dawn. Woodnymphs taunt and condemn the hunt gentlemen and male servants and Hilarion meets his death by being driven into the lake by the revengeful Wilis. 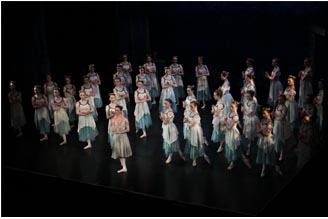 The costumes designed by Keith Bish have been beautifully updated and cleverly retain a period feel as well as accommodating the ballet shoes. 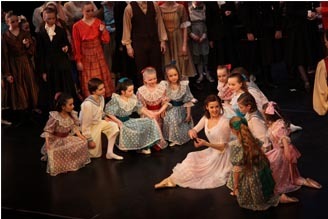 Giselle is a governess, a more sophisticated young woman who has a protective Father instead of a widowed Mother. Hilarion who has feelings for Giselle also has a girlfriend Lucienne. By introducing new characters to the ballet it adds more dramatic interaction between them and by setting the ballet in the early 1900's with the 'upstairs downstairs' theme new life is injected into a very classic ballet.